Welcome to the next installment in a multi-segment recap of a fun trip we took in the summer of 2008. The ostensible purpose of this particular week on the road was to take Ari, then not-quite-five, on a "daddy-daughter trip" to Washington to celebrate her brand-new status as a big sister, but in amidst the tourism we found time to squeeze in some radio as well, including several stops in a market that's never gotten its fair share of attention here: Charm City, Baltimore, Maryland. One of the highlights (for me, anyway, if not for Ari) was the chance to spend some time on "Television Hill," the highest point in Baltimore. 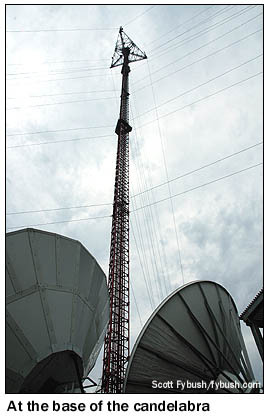 This rise of land in the Woodberry neighborhood, near Druid Hill Park off the Jones Falls Expressway (I-83) in northwest Baltimore, has been home to broadcasting almost from the start of television in Baltimore in the late forties, and today its two tall towers carry most of the city's TV signals along with several FMs. The more distinctive of the two towers is the shorter one, the 997-foot candelabra that was built in the early 1960s as a joint venture of the city's "big three" network affiliates. The candelabra's base adjoins the studio building of the first station to call Television Hill home, WJZ-TV (Channel 13), which came on the air here in 1949 as ABC affiliate WAAM, with a smaller studio building (which I believe still exists as the core of the current building at the top of Malden Avenue) and a shorter tower. WAAM changed calls to WJZ in 1957, as new owner Westinghouse grabbed the recently-abandoned New York City callsign with the argument that "WJZ" held significant historic meaning for the company, notwithstanding that Westinghouse had only owned the original WJZ for a few years before handing it off to RCA. The third station on the candelabra, WMAR-TV (Channel 2), was Baltimore's oldest, having made its debut in 1947. Its studios never moved up here to the hill, instead relocating from their original downtown home in the Sunpapers Building to a new building north of the city. 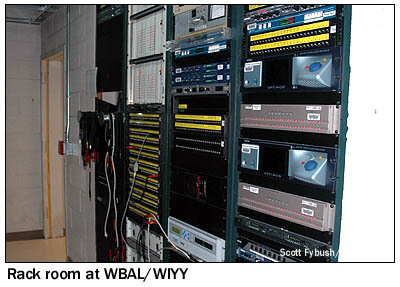 But our tour this cloudy late-July morning is actually more about radio than TV, as we head to the top floor of the WBAL building in the company of Kerry Plackmeyer, chief engineer for WBAL-TV's sister stations WBAL (1090) and WIYY (97.9). 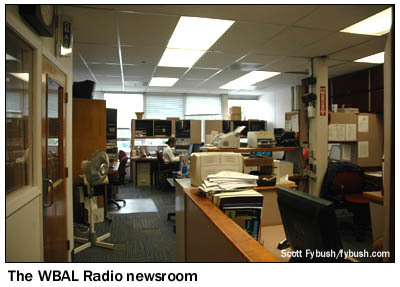 The building was undergoing some pretty extensive renovations when we stopped by, so we don't have a lot of interior photos to show you, but here are a few at least: above at left is the compact but functional newsroom for "Radio 11," complete with its own news booth near the doorway. 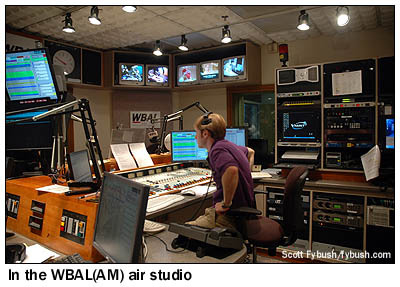 The WBAL and WIYY air studios are across the hall, and we didn't make it into WIYY's because the morning show was still on the air, and with a not-quite-five-year-old in tow, nobody was quite sure how we'd explain the, er, "adult entertainers" who were the in-studio guests that day. The studios for both stations back up to a nicely-equipped rack room full of processing, automation (including the servers that power WIYY's two HD subchannels, "Classic 98 Rock" on 97.9-2 and "Indie 97.9" on 97.9-3, and the STL that gets the AM 1090 programming out to the transmitter site in suburban Randallstown. 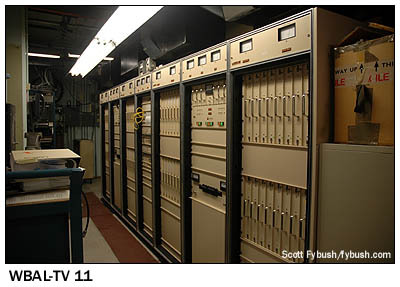 The programming for WIYY doesn't have as far to go: the transmitter room for the FM and TV stations is right here in the building, and in these months before the DTV transition it's packed full. 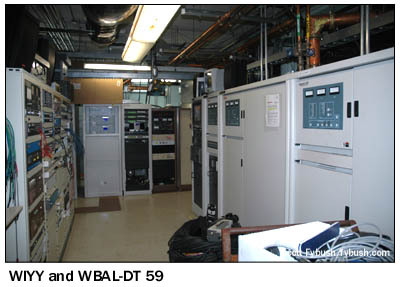 There's the Larcan solid-state channel 11 transmitter that was then doing analog and would later be reconfigured for WBAL-DT's VHF operation, and the Harris UHF transmitter (below right) for WBAL-DT's interim channel 59 operation. At the rear of that photo is the row of WIYY transmitters - the current Harris Z-series analog and digital transmitters (seen only in part here) and the older Continental that's off to the right. Out back, there's actually a small road that runs between the adjacent WBAL and WJZ buildings, past the satellite dishes for WBAL to the base of the tower, which is fed by three long runs of transmission line, one from the WJZ building, one from the WBAL building and a third from the much smaller WMAR-TV transmitter building behind WBAL's building. In one of those weird DTV transition anomalies, WMAR-DT ended up relocating from its interim channel 52 to post-transition channel 38, the frequency previously occupied by WJZ-DT's transitional signal, which has since returned to 13. 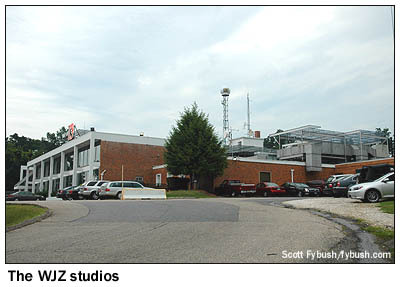 To expedite matters, WMAR simply bought WJZ's channel 38 transmitter and apparently kept it in place in the WJZ building, so the old WMAR building may be empty at the moment. 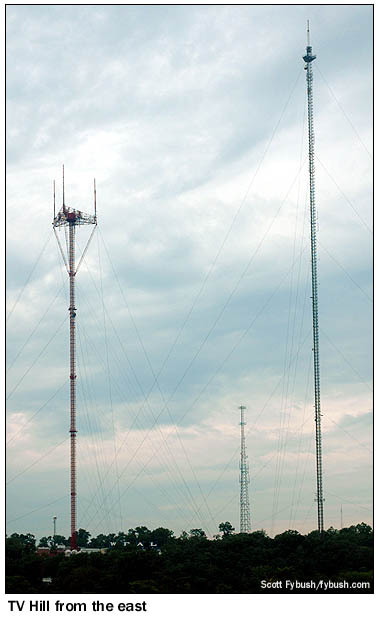 As for FM, it wasn't long after our visit before another signal came to TV Hill: Clear Channel's WCHH (now WZFT) 104.3 is now operating from a directional panel antenna mounted on the taller of the two towers on the hill. 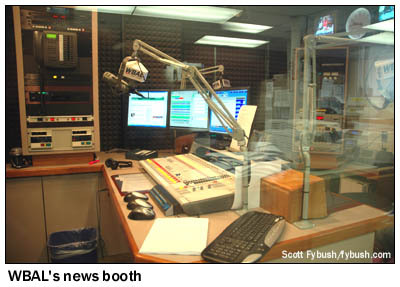 Another FM station, CBS Radio's WWMX (106.5, the former WMAR-FM), also operates from a panel antenna on that tower, the one at right in the picture at the top of the page. 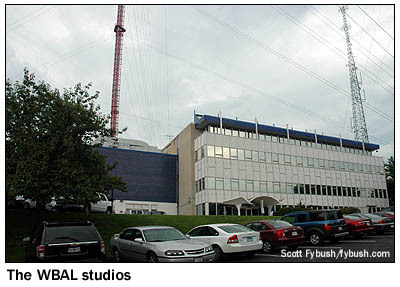 That 1280' tower belongs to Sinclair, the big broadcast group that started here in Baltimore at WBFF (Channel 45), the Fox affiliate that operates from a building on West 41st Street at the foot of TV Hill, shared with sister station WNUV (Channel 54), the CW affiliate here. 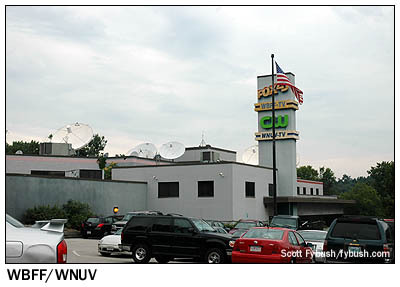 Both stations operate on UHF from the tall tower, WBFF on RF channel 46 and WNUV on RF channel 40. This series of Site of the Week installments is once again accompanied by weekly ID updates over at our sister site, TopHour.com. 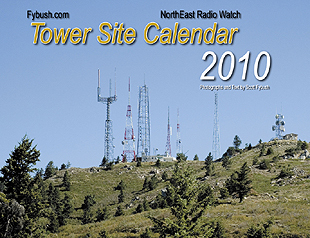 Stop by on Wednesday, Jan. 20 for the second of two big batches of Bawlmer IDs...and in the meantime, don't miss your chance to grab one of the dwindling remaining stash of the all-new Tower Site Calendar 2010, just in time to fill that space on the wall where your 2009 edition once hung. Thanks to Kerry Plackmeyer for the tours!